The compact size of the outdoor units allows for many installation opportunities. A high performance, low noise, large capacity DC twin rotary compressor is used. When the temperature drops you don’t want to be left in the cold. It’s important to choose a heat pump system rated for the climate you live in. If your system doesn’t operate in severe conditions, you and your family could be left without any heat at all. 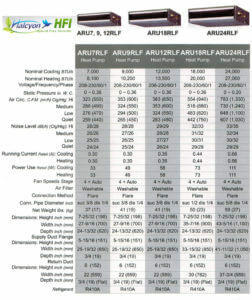 Fujitsu’s line of mini-split heat pumps come in different sizes, styles, and rated outdoor temperatures. The XLTH Series features outdoor condensing units engineered to operate in temperatures down to -15°F, lower than any other mini-split available today. 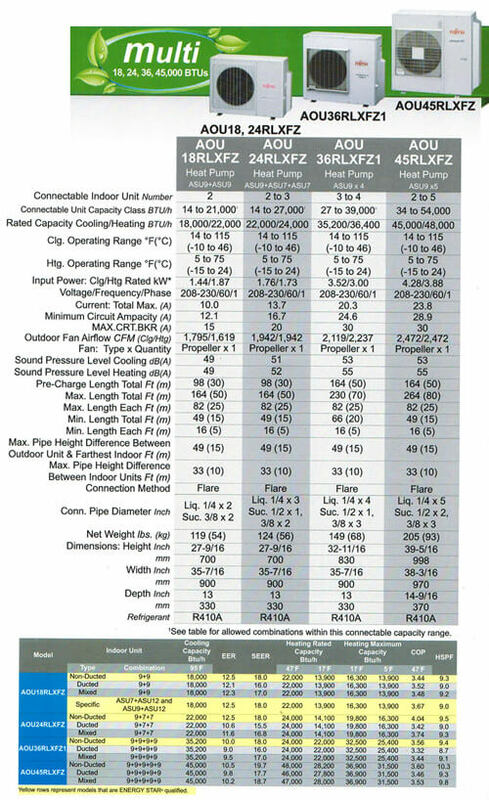 Other models may go as low as -5°F, however they do not include a base heater and other advancements found in XLTH models. When temperatures reach 36°F, a built-in heater warms the base of the outdoor unit so that condensation doesn’t freeze. Without a heater, freezing condensate can cause noise, damage to the fan blade, condenser, and system performance. The cultivated base design discharges melted water through many holes located at the bottom of the unit. heat exchanger and a high capacity compressor. Halcyon systems eliminate the need for a basement or attic-located evaporator unit and bulky ductwork by using thin copper tubing that pumps refrigerant directly to discreet wall mounted or concealed units inside. Even more remarkable, this same unit works in reverse in winter, absorbing heat from the outside air and moving it indoors to heat your home. The result? Efficient cooling and heating for year-round, whole-house comfort in most climates. How Does a Mini-Split Work? Like your refrigerator, heat pumps use electricity to pump refrigerant and transfer heat from one space to another. When we transfer heat from within our home to the outdoors, we call it “air conditioning”. Conversely, when we transfer heat from the outdoors to within the home, we call it a “heat-pump”. • Available only with optional wired remote controller. • Feature of 8RlFW1 and 12RLFW1 only. • Feature of 18RLXFW and 24RLXFW only. • Operation monitoring and On/Off control only. Fits into a standard ceiling tile*. *Dimensions of outer grille am 27-9/16″ x 9/16″ and may overlap adjacent tiles. Air distribution is evenly spread across the heat exchanger by the new 2 stage turbo fan which produces two separate airflow streams. Mixes room air then passes through the heat exchanger. + Available only with optional wireless remote control. **Requires Fujitsu’s Optional Fresh Air Kit part #UTZ-VXAA. Allows for a 4-inch flex duct connection and a field supplied duct booster fan. 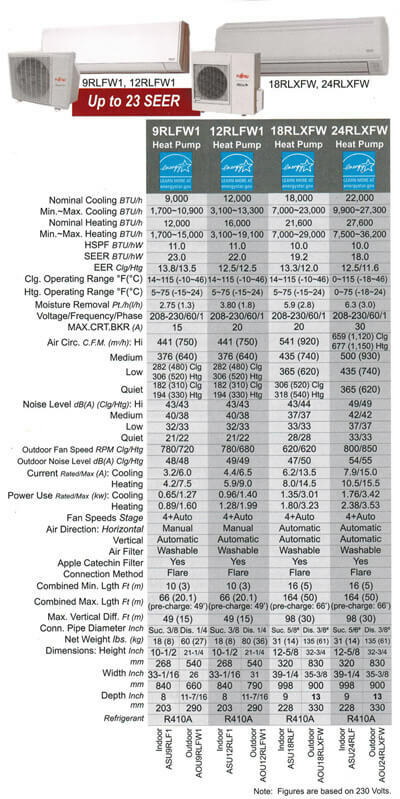 Fresh air maximum is 10% of unit High fan CFM. 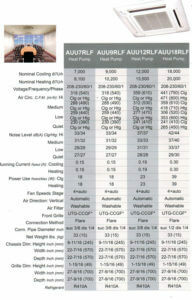 See UTZ-VXAA Design and Technical Manual for fan static pressure requirements at Fresh Air Kit. 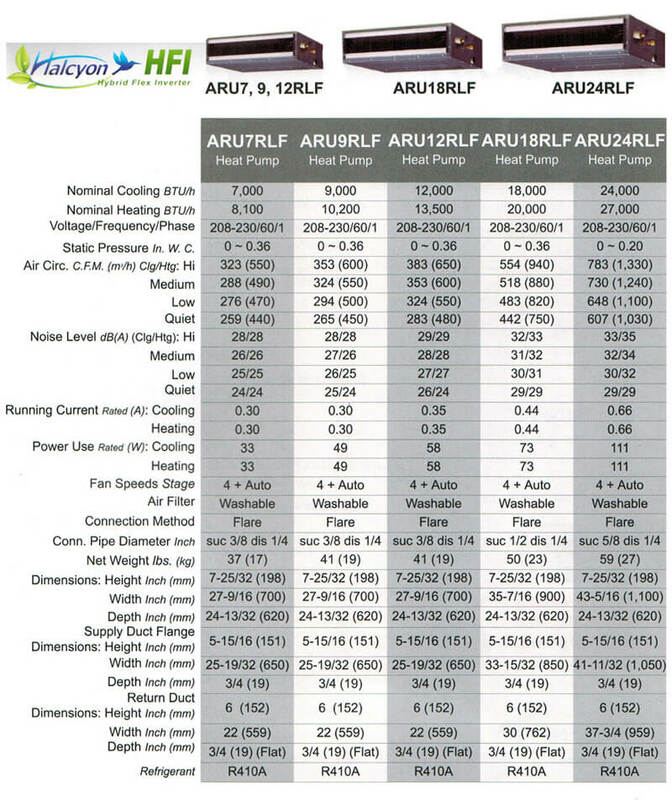 Add hood, filter and duct losses for fan total static pressure requirements. Will add 4″ to the height of the indoor unit. • Compact Cassette Grille UTG-CCGF sold separately. Must order one with each compact cassette. Dust, mold spores and micro-organisms are absorbed onto the filter by static electricity and growth is inhibited and deactivated. 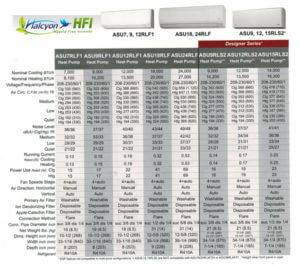 + The filter can be used for approximately 3 years if it is washed with water when dirty to restore its surface action. Features vary by model and therefore standard wireless remote controls should be used with the models they are associated with. Because refrigerant is naturally much colder than outdoor temperatures even on a very cold day, it actually absorbs heat from outdoors, and transfers the heat it absorbs outside to within your home. The refrigerant’s physical properties do this naturally. What you pay for is the electricity to pump refrigerant via copper tubing from outdoors to indoors. Because we move the heat rather than create it (as electric baseboard or resistant heat does), we can deliver up to 4 times the heat for the energy we consume! Come spring and summer, simply reverse the process and put the same system into “cooling mode” and transfer heat from indoors to the outside. For many climates, the advanced technology that goes into these units creates a far more cost effective alternative to either gas or oil-fired units for heat, or a central ducted system for air conditioning. Fujitsu’s mini-splits come in both cooling-only models or heat pumps, which provide both heating and cooling. a clean, aesthetic design and are small but mighty and shorter in length than competing units, helping them blend into any room. These 16-SEER heat pump systems now feature Inverter technology, environmentally friendly R410A refrigerant, both heating and cooling operation, quiet mode and easy maintenance. This category of equipment is ideal for smaller spaces where spot cooling or heating is required. Residential applications including sunrooms and additions are made easier with these 115 volt heat pumps. Do you have a warm or cool spot in your home? Fujitsu mini-splits can provide extra cooling or heating capacity for those hard to cool areas. Commercially, their small size makes them ideal for small offices, providing individual temperature control. Front panel is easily removed for cleaning. Flexible Installation Horizontal or vertical*. 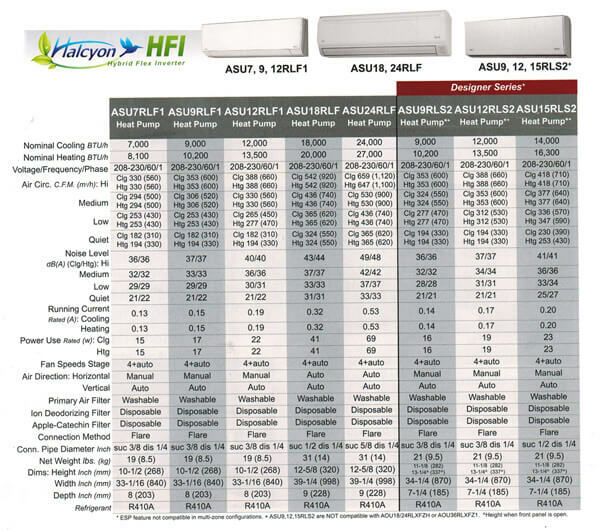 Filters are sized to keep velocities and static pressure loss low. This will insure sufficient static pressure is available for ductwork, fittings and supply and return grilles. Alternative filter sizes with equivalent face areas can be used. Having both upper and lower airflow quickly warms or cools the entire room. Floor mount can be set in “Upward Airflow Only” when occupants wish not to have feet warmed or cooled. and 20 minutes later, set temperature is increased by 4°F when cooling and reduced by 8°F when heating. When you come back to the room, it returns to previous operating mode. This feature can be deactivated if chosen. 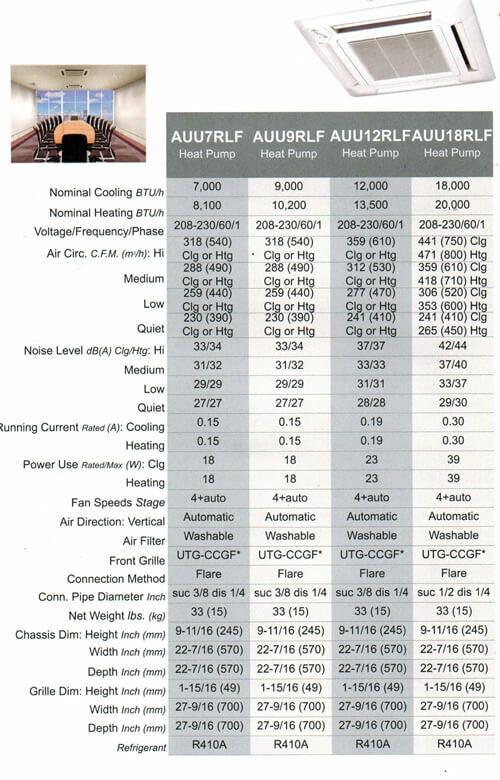 Heating capacity at low outdoor temperatures was improved by adopting a large heat exchanger and a high capacity compressor. 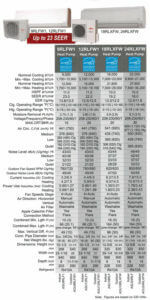 Standard rated heating capacity is maintained down to 3°F. 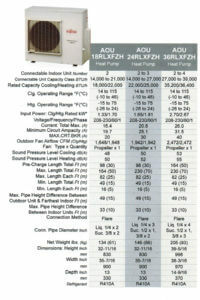 RLS3H models will deliver more than 73% of rated heating capacity at -15°F. • Cultivated base design discharges melted water through many holes.